Review of "The Arctic Incident"
The Arctic Incident (Artemis Fowl, Book 2) by Eoin Colfer is the second book in the Artemis Fowl series. It is a well-written, fun filled fantasy for children. It continues the story of Artemis Fowl, now 13-year old, the boy genius and anti-hero sets out to save his father from the Russian Mafiya (sic). Artemis Fowl is set on an estate on the outskirts of Dublin, Ireland and in Arctic Russia. At the beginning of Book II, it is made clear to the reader that Artemis Junior's belief that his father, Artemis Fowl Senior, a wealthy Irish crime lord, was alive, indeed, is correct. When his ship, the Fowl Star, sank in his attempt to bring 250,000 cans of cola to the Russians, Artemis Fowl Sr. was found alive and has been held prisoner for the past two years by the Russian Mafiya. At the beginning of Book II, the Mafiya has decided that it is time to negotiate a ransom for Artemis Senior. The price is steep and the deal is time limited. This would not be a major issue except just as Artemis is ready to set out, he is kidnapped by "The People" a race of fairies living underground. It seems that members of the goblin triad, B'wa Kell, have been found with human batteries. Since goblins are basically very dumb, it becomes clear that someone, not goblin, is directing their operations. Artemis is immediately blamed and is taken prisoner alone with his trusty bodyguard, Butler by Holly Short. (Holly Short, a captain of the LEPrecon (Lower Elemental Police Reconnaissance) an elite force trained in dealing with the "Mud People" (humans) appeared in Book I.) After it becomes clear that Artemis et al. are innocent, their services are enlisted to find and destroy the goblins connection in exchange for their services in gaining the release of Artemis Senior. Working under enormous time pressure, their task is accomplished, but when Holly and her superior Commander Root, set out to fulfill their part of the bargain, a coup occurs underground in the land of "the People." Foaly, the techie centaur, is accused of heading up the revolution. Holly, Julius, Foaly, Artemis Jr., and Butler race against time to save The People from an evil dictator and save the life of Artemis Senior. Also look for the return of Mulch Diggums, the "kleptomaniac dwarf" to return in a starring role in this novel. Artemis Fowl continues to ride on the popularity of Harry Potter, but in its own unique way. In Book II, Artemis Fowl becomes more likeable. As his love for his father becomes more apparent, his selfish behavior begins to fade away. Also in Book II, not only does the human-fairy alliance grow and deepen, but so do the many relationships and partnerships. As the relationships grow, the quips and verbal sparring also intensifies. In my opinion, Book II has a more interesting plot than Book I, however the story flow was rough at times. I found myself rereading sections trying to figure out who was doing what to whom or how some one ended up somewhere. 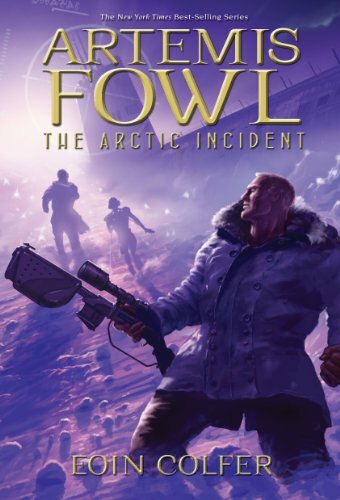 The Arctic Incident (Artemis Fowl, Book 2) by Eoin Colfer is the second book in the "Artemis Fowl series". The series is interesting, but not as challenging to read for a young reader or as daunting to lift as the Harry Potter series. The book is recommended for ages 10 years and up. I recommend this book.